Don’t sit there whining -hustle up and keep on coming back..
A full fifty years before the 1994 Nebraska Football squad would prove its moxie, World War II’s most sensational and extraordinary naval engagement took place in the Philippine Sea in June of 1944. American and a bulk of all remaining Japanese aircraft carriers were pitted in a duel -a battle for the ages, seeking pivotal island air base supremacy- each launching hundreds of sorties non-stop for a full two days. When the smoke and flack cleared on what is now known as the ‘Great Marianas Turkey Shoot’ and America’s decisive victory, three Imperial Japanese aircraft carriers and over four hundred Japanese aircraft lay at the bottom of the deepest ocean floor known to man. Like Lieutenant Sharp, going the extra yard has been the hallmark of many a Nebraskan, a trait very much exemplified in Nebraska Tight End Matt Shaw’s story. A self-made contributor through undying effort and laser-like focus, his was a journey of friendship, love, revenge, retribution, toil and role acceptance. 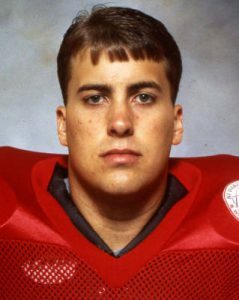 I’ll never forget the early February 1994 day in the weight room when he forced his body to endure three sets of 500 lb. squats as the first exercise on the Metabolic Power circuit: a routine consisting of 36 minutes of pure, self-inflicted, bodily hell that would make any fit individual lose his lunch. Physically wasted until his frame could endure no more, he left the weight room in shorts, t-shirt and tennis shoes for a walk through the more-than-brisk winter air with the intent on making his way across the Memorial Stadium’s turf for the South Stadium locker room. Let’s hear Matt Shaw’s memories of that taxing, bewildering, and eventually glorious 1994 championship battle when it all came to a climax. Question: Hey Matt, what year was your first fall camp? 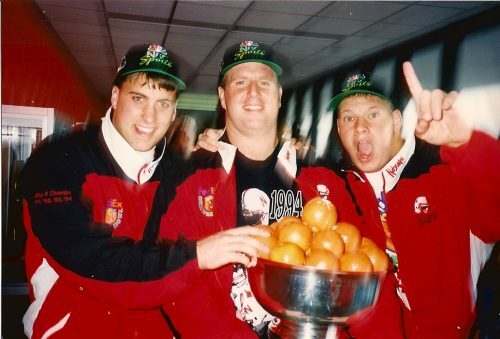 Matt Shaw: It was 1990. Q: What was that first camp like when you just joined the team? MS: It was kind of intimidating for the most part. I was originally a walk-on, kind of undersized when I first started, around all these fantastic athletes. Kind of one of those, “What am I getting myself into?” kind of things. The first few days you were trying do everything you could to fit in, while inside you were overwhelmed a little bit. It was such a big-time atmosphere, it wasn’t like high school. You had all these other guys with scholarship offers and you were thinking of how things would work out. Q: Finding where you might fit in the pecking order? MS: Wondering if I was even peck-able! (laughs) I mean, I was a 180-pound tight end. That’s not much. Physically, I had a ways to go to get even close to being on the field, feeling that I was a project. And I knew it wasn’t going to be an overnight thing. I think that’s the thing that probably helped me the most: that I had the desire to make it happen. And I had a good understanding. The key for me? Just knowing that there needed to be a series of goals to try to accomplish- and eventually bigger things will happen. Q: So you started out wondering if you were even peck-able and then ended up finishing your senior year in a most impeccable way? MS: That’s kind of how the plan was supposed to work, and it ended up working how it was supposed to. I got lucky and didn’t get any injuries. Just put my time in, worked hard and it all worked out pretty good for me. MS: Yeah, I redshirted my second year. My first year was the last year they had the freshman team, so I played freshman ball and then I redshirted, and some of the guys who they thought could contribute they would redshirt right away, but most of the walk-ons played freshman football. And I think about a third of the scholarship class, maybe more, played with us, and they redshirted their next year. Because those were guys that would be better served playing freshman ball and developing the second year if they weren’t going to contribute on varsity. So that’s how that usually worked out. Q: Do you recall your first day on campus? MS: I knew a few guys from Nebraska, growing up playing them. You’re at your first fall camp: you eat together, you practice, meetings, all that stuff, you develop relationships fairly quickly. Sometimes you saw a guy and figured what position he played just by looking at them. Some guys, they’d look really good and then they’d be really bad football players, ’cause you really can’t judge an athlete by how they look. I just remember a few guys who looked like they’d be tremendous football players, but they just weren’t athletes. Q: “Looks like Tarzan & plays like Jane”? MS: Yeah. But here were some guys that you just weren’t that impressed with, and they were pretty darn good football players. Q: Do you recall the first good friend you made on the team? MS: Yeah, Tom Seiler. Shaw and Seiler were pretty close alphabetically. He was a walk-on kicker from Las Vegas. I think we were next to each other in physicals and all, and we just kind of hit it off. He was an interesting guy, (laughs) and we both started up a friendship together. And Joel Wilks. We knew each other from playing sports in high school. Q: Did you start out as a tight end from the get-go? MS: Yes, right from the start. I think Bill Weber, the freshman head coach, did a lot of tight end work with me. 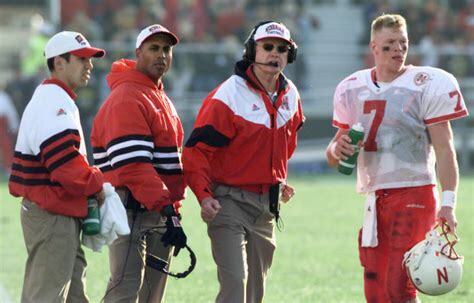 Then Gerry Gdowski, a graduate assistant, he was one that I remember, so he must have worked with us quite a bit. Q: So after your redshirt year, then you worked with Coach Ron Brown a lot? MS: He was the guy. He was the key figure even when you were on the freshman team. He’d always be looking to you, asking questions. He was a great coach. He was a great motivator, high energy, a real caring person who had everybody’s interests in mind. I remember some coaches that I’d witness who kind of took care of their boys, their select few. I always thought to be a good human being -the kind of person I’d like to have around my son: Coach Osborne, Coach Brown, Coach Tenopir- they treated people really well. Even if you weren’t a really great football player they’d treat you with respect. Coach Brown? He was very fair in his evaluations. I think most people who played for him knew that, and the best guy was going to play. Q: Comparing staff members, were the defensive coaches a little rougher around the edges? More tough love, maybe? MS: I think they were more ‘tough love,’ from what I observed. I got to know Coach Samuel very well, and I thought he pretty well treated everybody with respect. I thought he would have been a good coach to play with. There were some guys on the defensive side who I thought got their players to play well, but that they maybe had a favorite one or two and treated others as second-class citizens. It just wouldn’t have been that fun if I would have had to go through that. Come your 4th or 5th year, I’m sure some guys felt a little burned out and left out in those cases. I don’t know if that was the coach’s intent, but some guys find a way to contribute their 4th or 5th year when you don’t expect it, you know? Q: Do you recall your first time with Coach Osborne? Any interactions? MS: Most of my interactions were with Coach Brown, really. For Coach Osborne it was usually the little things like, “How are you doing? This is what you need to work on.” That type of thing. Coach Osborne was always just kind of a figure where you go, ‘Wow,’ he’s the main guy. Although he worked with everybody in practice, but year round it was mostly coach Brown, which was great. MS: He did a lot with our blocking, our technique, one-on-one blocking drills with the outside linebackers. He’d work with us while Coach Brown worked with the wide-outs on stuff like that. He’d always teach us how technique was real important with blocking; how you have to take the correct step, leverage with your body, in a very encouraging way. You might have just gotten smoked by a guy, but he wouldn’t make you feel like a total failure. He just had a way of encouraging you that you’d want to do better, but not making you feel bad if you didn’t pick up a drill. Especially with the young players, especially if you’re a young guy and you’re not going to be able to block some of these guys, you know, 250-pound All-Americans. You certainly didn’t look good, but Coach Osborne had a way of making you feel like you were making improvement, just made you feel like you could do it. He was kind of like one of those long-term planners where, “I’m not going to get it done today, but give me 3 or 4 years and it’ll all get better.” He just had a way of keeping that drive and that fire burning to make you want to keep doing it. 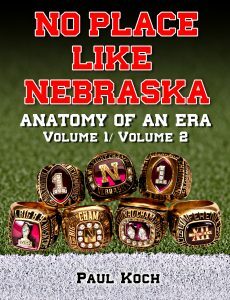 When I played there were a lot of walk-on tight ends who contributed throughout the ’80s and ’90s, and I think Coach Osborne and Coach Brown knew most of these guys weren’t going to contribute in year one or year two, and playing a lot of football those last two years as a key contributor were due to Coach Brown and Coach Osborne. You had Gerald Armstrong, who was originally 180 lbs. from Ponca, he was another guy that wasn’t recruited by anybody and just walked on. I remember Mitch Krenk as a kid in the ’80s. He was a walk-on, I remember. Johnny Mitchell? We were in the same class. He was playing right away, though. Q: Your first year was Kenny Walker’s last year on the team. Do you think having a player like him on the team did anything for the other teammates, in the way he overcame his deafness? MS: I think his effort and the way he approached everything was inspiration to a lot of people. I remember playing freshman football and moving up to varsity the last few weeks of the season. 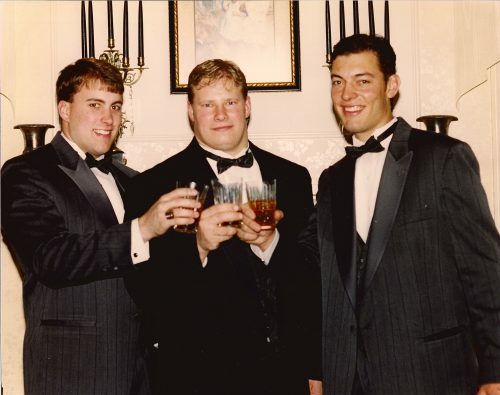 And it was kind of rough since I was just at the beginning level, but I remember he was a very businesslike guy and I’m sure that rubbed off on a lot of guys in a way that was positive. 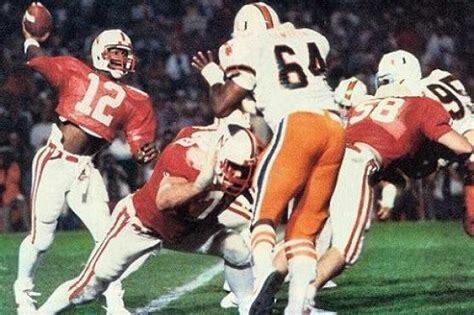 Q: So ’94 against Miami was your last game. What was that like? What do you recall from that evening? MS: It was probably the most athletic evening you could ever describe. Just a bunch of guys that had a quiet confidence about what was going to happen -whether we were down by 8 points in the 4th quarter or not- the whole time there was this quiet confidence that we were going to get it done. There wasn’t a lot of chit-chat about it or anything, just the ultimate athletic focus. We worked together. Amazing how that 4th quarter was almost an out-of-body experience. (laughs) I remember it, but I just remember being totally focused, never really nervous. I don’t think any of the guys got rattled. Even though we were in a hostile environment we just all had total, complete faith in the guy next to us. Q: Can you describe that hostile environment? Q: Let me ask you: those 4th-quarter touchdowns, was that the same end zone where the missed two point conversion pass to Jeff Smith happened in ’84? MS: Yeah, both of those were. We scored and got the two point conversion in the end zone, and then scored another touchdown in that open end. Q: Do you remember any of your assignments for that game, anybody you put your pads on? MS: Yeah, both the guys I played against that game were both first-round draft picks. Kenny Holmes and Kennard Lang, they both were first-round draft picks. They might both be done, but they were playing a few years ago. Two outside linebackers. Obviously they had Warren Sapp and Ray Lewis; I had to go get him a few times since he was a linebacker. Who’s that Reggae singer? His son was one of the linebackers, too. I’m sure he was a good athlete and stuff, but he was pretty undersized. He was fast, all over. But he wasn’t quite like the presence of Ray Lewis, with both speed and strength. Q: Any one, single play stand out to you from that night? MS: It was the ultimate pancake! The ultimate pancake under the ultimate pressure conditions. For the average fan, they don’t really see that. I wasn’t a receiving tight end. In fact, I didn’t catch any passes. My job was to go knock people on their backs. I was basically the starting tight end because I could block, and at that time in Nebraska history we ran the ball 90% of the time, so I was on the field 90% of the time. And that play was like my one-handed catch in the back of the end zone-kind of thing. (laughs) A block like that is something you dream about. You have good blocks, but rarely do you have a block like that, especially in that kind of position in the game. We picked up the first down, and then two plays later we scored, so that was pretty cool. Author assumes no responsibility for interviewee errors or misstatements of fact.